We need to redesign research to involve equitable participation of ALL stakeholders who have relevant interests and perspectives. That motivation is at the heart of our project and is why, as we began thinking about this grant work in the very early days, we began to reach out to talk to, share our ideas with, and learn from others who are working in the general areas we had identified. We had opportunities to talk to many researchers, clinicians, and doers in a lot of fields, all with various ideas and expertise. While most of the discussions we had were incredibly positive, supportive, and helpful in making sure we were not recreating the wheel, one of those conversations is still sticking in my mind. This conversation, like the others, was about sharing our ideas and plans, learning what this person was working on, and discussing any mutual areas of interest that came up in that discussion. However, this conversation went in a different direction than the others. First, Eric Hekler & I had a chance to talk about some of our planned work. Then, this person began explaining their work, and speaking about me and some of my previous work in the third person - while I was still actively on the call - to Eric. Their description of my work was incorrect. I felt awkward and unsure what to do in that situation, beyond trying to correct the factual inaccuracies. Being spoken about in third person left me feeling as if I couldn’t speak up during this interaction, which I otherwise would do. Afterward, I checked in with Eric to see if he had heard what I had heard - did I imagine the whole thing? - and to gauge if I was overreacting. Eric felt, equally, that something strange had occurred in the call. The more I reflected on this conversation, the more frustrated and awkward I felt about it. For our team, this interaction spurred on a lot of conversations both before we submitted the grant and afterward. It partially inspired us to recognize that what we wanted was to take a deeper look at the system (barrels, and the barrel makers), rather than individuals (apples), per our ‘apple or barrel’ perspective, as articulated in this blog post. It also got us to think about the diversity of perspectives, as well as the aspects of the team that existed prior to the project, which enabled us to work more effectively together, particularly with me as the PI. I needed to work through all of this before I felt ready to write about this. I wanted to make sure I had enough separation from this interaction so that I could think less about this particular conversation and, instead, aligned with the goals of my work & our team, more about the system that resulted in a particular person talking the way they did. Returning to the story, to help think through what about this situation was bothering me, and to be able to discuss it with Eric and the rest of the team, I started to draw. This actually became one of the first drawings I did, as a way to sort out my thoughts & impressions about the problem I was sensing. (And probably the first ‘sticky note science’ I started doing for this project - see here for an unrelated example.) I am by no means an artist and don’t really have any drawing skills, but it was a useful process to see what bubbled up. It helped me recognize that I felt disrespected and unheard when I was being spoken about in the third person while I was on the call. Upon further reflection, I realized that, in the conversation, it felt as though I was “the subject” that “the researchers” were “doing research” on and about. I felt like I wasn’t part of the conversation but, instead, a subject of conversation. This is a problem that is systemic, and larger than any individual. As another example, Eric reminded me that it also happened in the very first conversation Eric and I ever had about this potential work. When we first met, Eric’s offer was essentially that he could do a research study. The implication was that if Eric did the research on us, that research would, somehow, legitimize me, my work, the community’s work, and our collective perspectives. I would be a passive “research subject.” Thankfully, Eric had enough empathic regard to sense that his “offer” was not right and, instead, after hearing my response, pivoted to asking the question, “How can I help?”. We wouldn’t be here today collaborating together, or working on this grant project, if he had only offered answers (including the answer of “I can study you”) and didn’t ask questions. As the word “subject” suggests, this made me feel, in healthcare and in scientific research, like patients are often treated as if we have been placed in a cage. My feeling is often that we, as patients and subjects, have zero power at any stage in the traditional research process; our experiences, perspectives, and insights - and even data, particularly if we are an “outlier” - may be outright ignored because we are merely “the subject.” It’s literally built into the words describing us. We must be patient while we wait for someone to help us; in essence, assuming our powerlessness. We are the subject of what is discussed, not a discussant and, thus, powerless. The problem is particularly frustrating because, if I have zero power, I also have no ability to course correct any potential problems with research. This happens from conceptualizing the “research study” all the way to the “peer review” process of publishing the outcome of studies. You can certainly poke holes in much of this. Patients aren’t always treated as subjects in interactions with researchers. Patients and researchers don’t always have conflicting priorities. But it happens enough and is still built into the very words used to describe humans in the process and, as with the examples discussed here, often without the person even realizing it. The systems of incentives and resources and infrastructure are in place so that this is more often the norm than not - even when everyone at every stage is operating with good intentions. (As probably everyone reading this post is!) And currently, beyond individual conversations attempting to change the way we do research, there is no known mechanism to fix and improve this. Do I have all the answers? No. This is a large, complex problem. I don’t know how to solve it comprehensively, but I do know that speaking up about it as often as I can, having our Opening Pathways team continue to think about and address it in our work, and raising awareness and drawing other people into thinking about how we might improve the processes of scientific research and consensus building in healthcare is one of the things that I can do to help. Thanks Dana for this post. One of the interesting and important things you highlight is that conflicts typically begin at the first moment of conceptualizing the research project. Researchers are typically thinking in the context of trends and issues within their discipline; patients (and other participant-researchers) are typically have questions motivated by their personal goals and experiences. So ABC and XYZ aren’t just competing research priorities within the same discipline or group of disciplines, but expressions of profoundly different orientations toward discovery. The challenge starts there, in identifying areas of overlap (which of course do exist) between the concerns of different domains. I think that’s part of what you and Eric are developing, not just a set of overlapping research questions but also some generalizable approaches to developing these research questions. You hit the nail on the head, Gary! I’m looking forward to hearing more perspectives on tackling this challenge. Dana–this pretty much nails why we launched the MyLymeData patient registry. 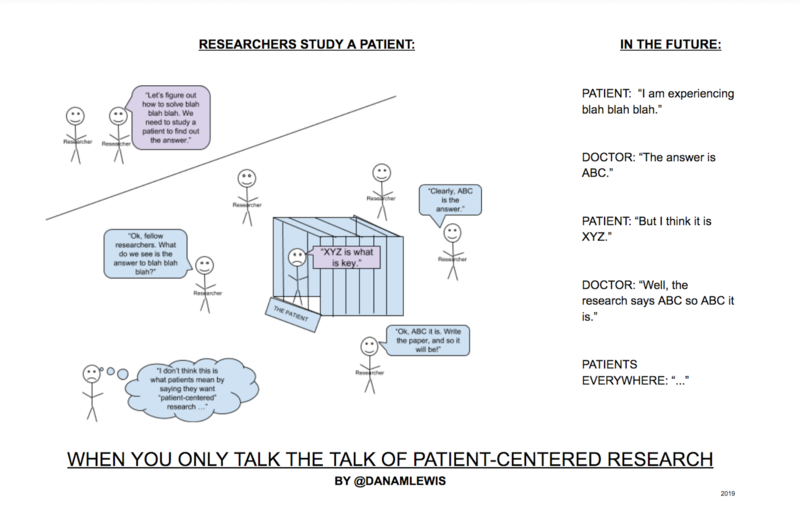 The traditional approach to research (Researcher-centric research) often leaves patients delegitimized. This is sometimes called helicopter research–where a team of experts sweeps in concocts a study–and leaves the community with the remains. Research needs to be done in partnership period. That is our model. Our experience though is that that partnership requires that patients take the lead. Lorraine, thanks for this comment and great example! I hadn’t heard that phrase of “helicopter research” before - but it makes a lot of sense to me. (We’ve done a similar thing with the OpenAPS Data Commons as well to facilitate research partnerships & focus on otherwise overlooked topics.) Looking forward to sharing your example in the future as well! This is seriously major patient autonomy stuff. Keep going. Trenchant analysis as usual, Dana. Given that the term “research subject” does tend to imply a passive status, it would likely go a great deal of good to re-name study participants as “collaborator participants” or “partner participants” so that the subjective meaning begins to shift the researchers’ thinking. I have to say, after a dozen attempts, I don’t get the right column of your cartoon. The “in the future” column seems no different from the cartoon itself, which I’m guessing is supposed to be the “today” version. Help? Dave, I think that’s because you get how it is today - for us as patients, both are the current reality and current experiences. I was attempting to draw primarily for those who do not see or have not seen the correlation between the research scenario and the future clinical encounters. Dana, thank you for this post and for your continued leadership! Speaking from my own experiences of trying to establish patient-driven research as a field within academia, I am well aware of how extremely hard it is… Keep up the good work and I hope the work you and Eric do together soon gets followers, the world needs it!